In the past decades, quotation theories have developed roughly along three lines—quotation types, meaning effects, and theoretical orientations toward the semantics/pragmatics distinction. 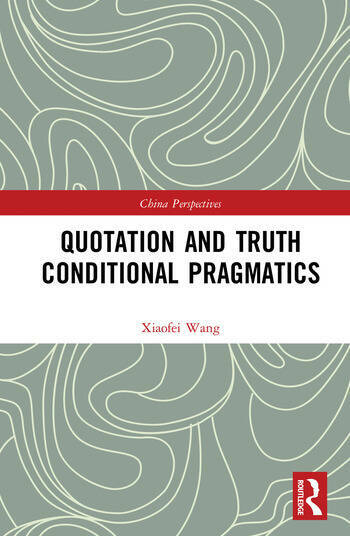 Currently, whether the quoted expression is truth-conditionally relevant to the quotational sentence, and if there is a truth-conditional impact, whether it is generated via semantic or pragmatic processes, have become the central concerns of quotation studies. In this book, quotation is clearly defined for the first time as a constituent embedded within yet distinctive from the quotational sentence. Also, as the first monograph to address the semantics/pragmatics boundary dispute over quotation, it argues that the semantic content of quotation amounts to its contribution to the intuitive truth-conditional content of the quotational utterance via two modes of presentation, which are incarnated in the functioning of quotation marks and manifested as use and mention. The use/mention-based analysis in this book can shed light on the semantic theorizing of other metalinguistic phenomena, while the semantics/pragmatics perspective will provide methodological implications for other relevant studies. The new conception of quotation and thought-provoking analysis on use/mention, truth-conditional pragmatics, and the semantics/pragmatics boundary in this book will appeal to scholars and students in philosophy of language and linguistics. It will also serve as a clear guide to the current state of quotation studies and how to formulate a semantic theory of quotation. Xiaofei Wang is an associate professor of linguistics at the University of Electronic Science and Engineering of China. Her research interests include truth-conditional pragmatics and the semantics/pragmatics boundary dispute.